I wanted to do a quick post on some of the work outfits I have worn for work. I took photographs of the ones I really liked from the last week, unfortunately, once Wednesday came I mainly wore jeans, tee shirts and my hiking trainers with no makeup. My current job has a very casual dress code, for me this creates a dilemma on deciding what to wear because I can be capricious and indecisive. In my previous job, I was required to wear a uniform, which made life so much easier for choice in outfits. However, I feel much more comfortable with in this job about being me in comparison to my old job. Generally for everyday life, I prefer to wear something simple, smart and casual. I like to accessorize with my jewelry, I typically wear complimenting earrings, necklace, bracelet and my favourite watch. My makeup, I tend to wear natural and muted colours, along with wearing minimal liquid eyeliner, personally, I think it makes draws attention to my eyes. I apologise for the poor quality photographs. 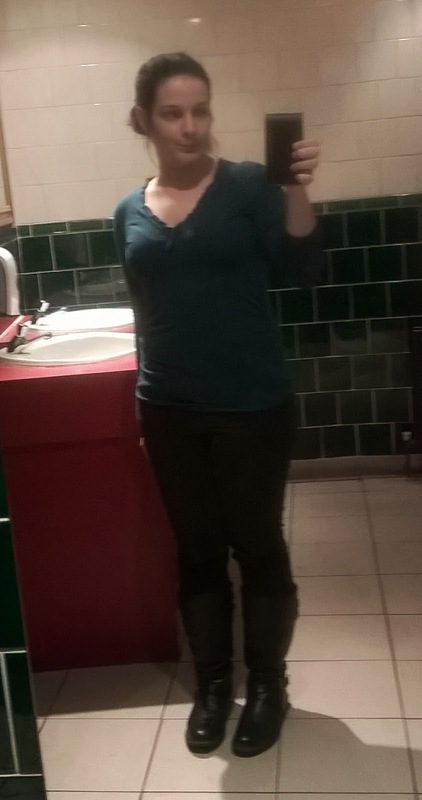 I wore this outfit last Friday, I went out straight from work to the pub and to see a band. This is close up of the top I wore, and I found it in a local charity shop. The top looked fantastic on and really complimented my skirt. Even though, it's difficult to see it, was made floral jacquard print, and this is one I made myself. You can't see them, I wore my biker boots from next and cost £85. I haven't included any outfits from last weekend because I wore my pajamas and spent most of the weekend on my boyfriend couch, watching television. I really don't think people would like to see in my pj's. 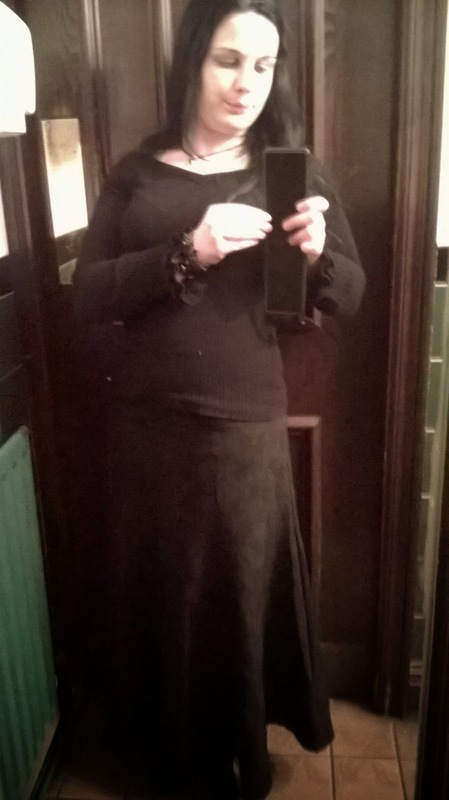 The outfit from last Monday, I wore; a military style cotton dress by Primark, I found in a charity shop in Ireland - 3 euro. 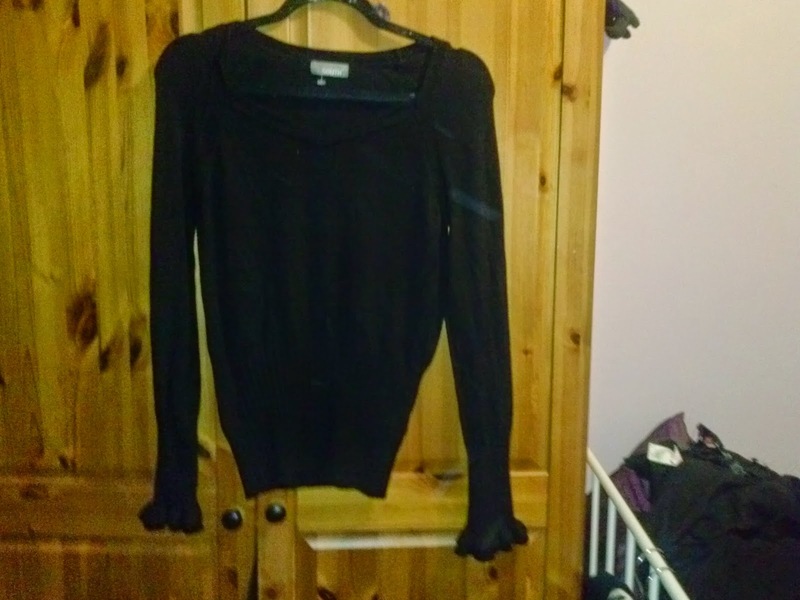 My cardigan was by Karen Millen, I absolutely, love her designs despite being expensive, and I paid £95 for the cardigan, I rarely, buy things this expensive. I brought these boots from Asda two years ago for £40,and they are the most comfortable pair of boots, I ever owned and look great with any outfit. Below, this outfit I wore on Tuesday its more causal in comparison to the previous outfits. It's very unusual for me to wear colour, but I loved the teal colour and the v-neck style of this top. 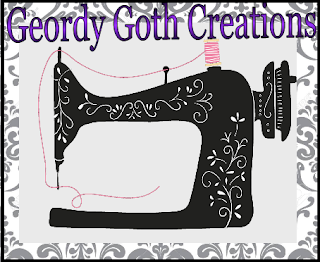 This was first time I wore it and I found it very comfortable, flattening, to wear. The top is by coast, and I paid £6 from a local charity shop.